i'm feeling especially drawn to dark deep browns, and shimmering golds and blue greens these days. speaking of color, i'm mesmerized by these photos: america in color from 1939-1943. there's something really surreal about seeing this era in color. i was reminded yesterday that some of you might not be familiar with the apparatus or the process of combing and combining fiber to make it ready to spin. a drum carder uses two drums, both covered with little metal teeth, to straighten fiber (it's pretty curly when it comes off the sheep). for me, one of the most exciting things about having a drum carder is the possibilities it opens up for combining and blending different fibers, textures and colors! the sky is the limit. there's a kind of free-form energy about carding that really appeals to me. toss in whatever's lying around! if it can go through those little teeth, it can be carded. the final product is a batt- basically a nice big roll of fluff ready to be spun. there are a few different modes of spinning from a batt, but i generally unroll, and tear off strips about two fingers wide. these batts are wool carded with soy silk, and hopefully i will have some yarn to show from them soon. i finally unpacked my drum carder. we've been in our "new" place for 2 whole years and somehow the carder never made it's way out of storage! i had kind of forgotten how much fun it can be to use, and was recently even toying with selling the thing. i'm so happy that i didn't. these are the final batts we made. probably not so little house-y, but very fun nonetheless. ...is something that doesn't happen as often as i'd like it too. the little girl is very fascinated by my wheel, and little fingers + rapidly spinning bobbins don't go well together. when i do finish something, i feel like i have cause to celebrate! this one was a lot of fun to make and it's now in my etsy shop. also, some friday funnies that have had me snickering. the asticou azalea garden is a little bit of heaven on earth. we went downeast for a visit with family + friends this weekend. it was spectacular. truly, truly lovely. have you seen claire anne obrien's knit stools? they're pretty spectacular too. it's elizabeth zimmerman's classic pattern, and i knit it last winter. it still needs a zipper, but it fits her really well right now and the super chunky handspun (pippikneesocks) makes it the perfect chilly weather jacket. here's a ravelry link for my tomten if you are interested. i'm also loving they draw and cook. 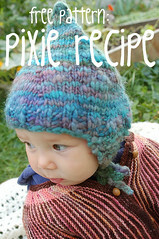 congrats, gretchen, you are the winner of my knit hat giveaway! email me at aprillnewman@gmail.com with your color choice*, size preference (adult M or L) and mailing address, and i will pick up my needles and get to work! thanks so much to everyone who played along! *there are fewer colors available than i had originally planned. i was kind of a doofus and didn't check to make sure i still had what i thought i had. oops! the picture shows the grey, black and plum that i do have to pick from. i'm having fun choosing library books for greta these days. we're all loving last night by hyewon yum. it's wordless, leaving all the more space for yum's gorgeous, magical prints. greta plays produce inspector/ flower arranger.